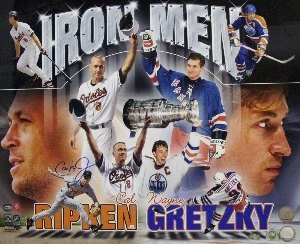 This 16x20 photo shows Cal Ripken, Jr and Wayne Gretzky, the two Iron Men of their respective sports, and is autographed by Cal Ripken, Jr. This rare 16x20 is signed by baseballs consecutive games record holder Cal Ripken Jr. (pictured with Gretzky). Official Ironclad Authentics Certificate of Authenticity and hologram, and MLB Authenticity hologram included with your order.